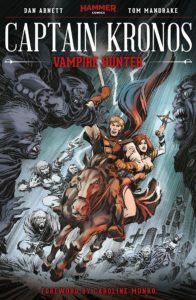 In the depths of eastern Europe, the legendary vampire hunter, Captain Kronos and his two assistants, Grost and Carla are called upon to help rid a town of it’s vampire plague. The secluded village of Serechurch has a problem. For ten years now, a vampire lord calling himself “Slake” has prowled her streets and preyed on her citizens. The council of elders could do nothing to rid their town of this threat, but isolated him behind a fence, sacrificing the poorest section of town so that the rest could live on in relative security. This state of tenuous balance is altered by the arrival of Captain Kronos, stalwart hunter of vampires in all of their breeds, and his companions Professor Grost and the fierce gypsy woman Carla. The trio must discover what manner of bloodsucking fiend this “Slake” is, before they can rid Serechurch and the world of his blight. Damn, that’s all pretty dramatic, hey? You should really watch some of those old Hammer horror films. For years the company produced movies that defined the horror industry, leaning heavily on the tried and true vampire genre. Over time, as generally happens, audiences began to drift away from those old stories as they looked for something new. The old Hammer films didn’t have any surprises in them anymore, the vampire becoming more of the sympathetic character as he was relentlessly hunted and inevitably slain by the hunter. Then in 1971, Michael Carreras came into the picture. He wanted to reinvent the old genre, to revitalize the Hammer Films name. With the creative assistance of Brian Clemens and Albert Fennell, two of the minds behind the still popular British espionage series The Avengers, a new kind of hero joined the hunt. 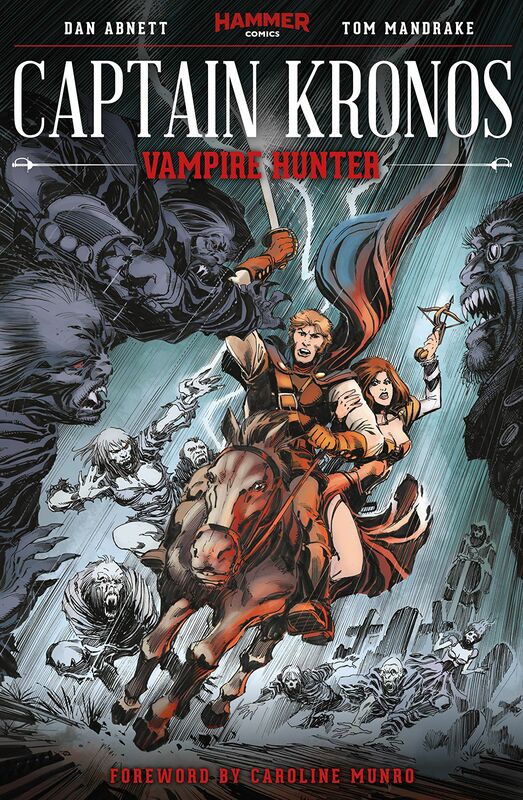 1972’s Hammer classic, “Captain Kronos, Vampire Hunter”, became a sensation. German actor Horst Janson’s physicality and skill with a sword encapsulated the larger than life persona of the heroic Kronos. His onscreen cohorts, Professor Grost (John Cater) and Carla (Caroline Munro) followed the good Captain into the fray without hesitation and a new kind of heroic team was born. I became very familiar with Kronos as a kid (never missed an airing if I could help it, mostly thanks to the “Son of Svengoolie”), but years have passed and the modern age has left many of the classics behind. Fast-forward a bit, and now Hammer and Titan Comics are bringing Captain Kronos and company back into the fray. Dan Abnett, a well-known and bestselling author in the realm of science fiction (as well as an outstanding run with the Legion of Superheroes which I reviewed back in January), has taken on the writing duties behind the return of the horror movie classic. His dialogue is just campy enough to harken back to Kronos’s roots, but he pulls back on the reins before things get too goofy. 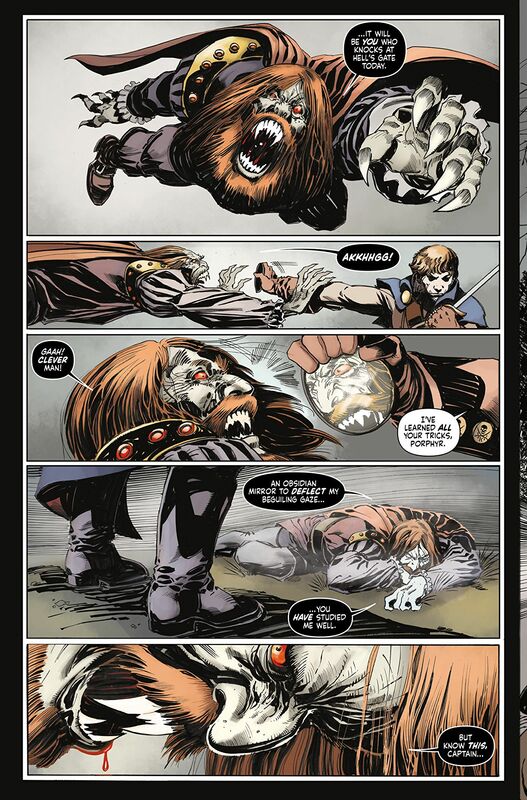 If anything, the dialogue among the three main characters- Kronos, Grost, and Carla- could very easily pave the way for a revival of this world, bringing these blended stories of action/horror back into the collective consciousness. And after a recent re-viewing of the original movie, I’m very pleased to announce that Carla’s character is fleshed out to be more than a tumble for the Captain (it was a 70’s movie from Hammer Films, remember?). She’s been taken on as Professor Grost’s pupil in Vampire Lore 101, and is right in the middle of the fight alongside the boys. 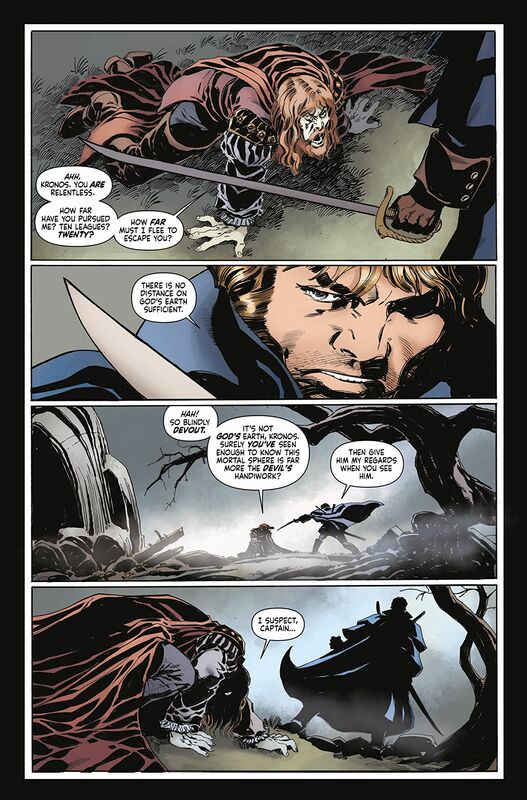 Visually, Captain Kronos’s adventures translate very well into the comicbook medium. The artistic style of Tom Mandrake fits perfectly, keeping to a very classic look that reminded me of John Buscema’s work with Marvel’s run of Conan the Barbarian comics, and is fleshed out by Sian Mandrake’s coloring. Between the two of them, the Mandrakes have caught the tone of the swashbuckling vampire hunters to a tee. The abundant action sequences have all of the over the top dynamics that any fan could hope for, with sword-swinging and head-lopping galore. One of the things that brings older readers back to comicbooks, at least for me personally, is nostalgia. There can’t be any other explanation for the fascination grown adults have for the antics of larger than life figures flying around in colorful spandex tights, righting wrongs and smashing evil in the face. 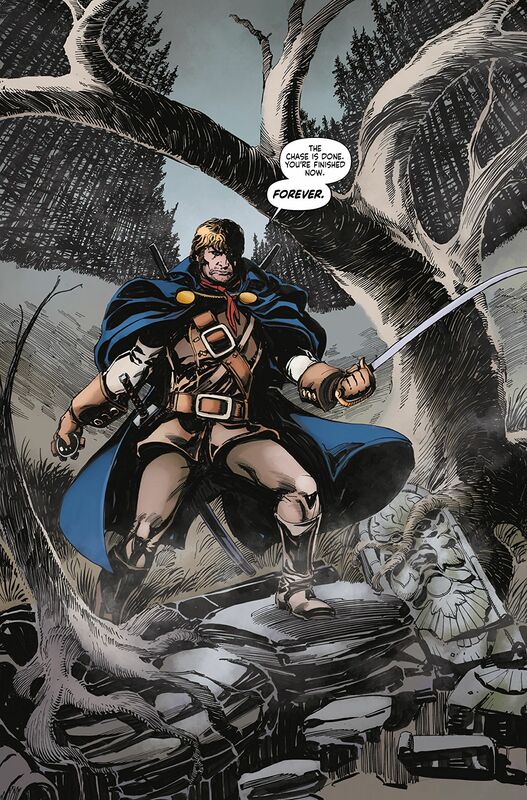 With that in mind, I can’t see any reason that Captain Kronos and company shouldn’t continue on in their war against the forces of darkness. They’ve been doing it since long before the likes of Blade or Buffy ever put a stake through a heart, and I hope that this story arc marks the beginning of many more beheadings to come.